We really enjoy Disney movies. My husband and I are really big kids at heart. We especially enjoy watching these movies with our kids. To pick a favorite is kinda hard. One of our favorites is Alice in Wonderland. We all know the story of the young girl with a wonderful imagination. 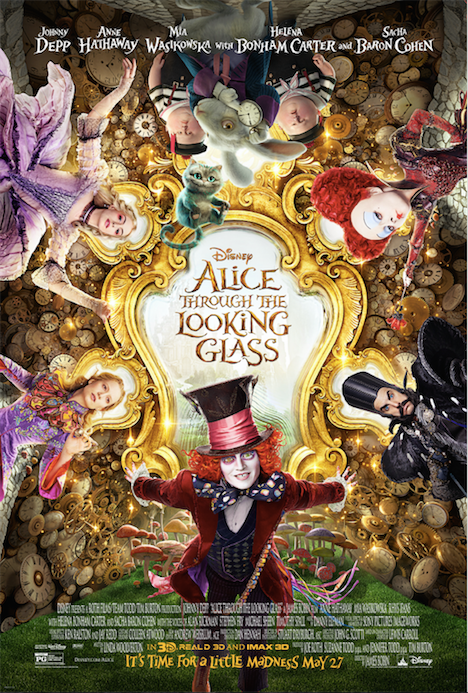 I was invited to attend an advance movie screening of Alice's newest adventure, Alice Through The Looking Glass. All opinions stated are my own based on my personal experience. Synopsis-Alice returns to the whimsical world of Underland and travel back in time to save the Mad Hatter. Alice is an adventurer like I am. Nothing scares her. Her spirit reminds me of my daughter, so fearless. The reason I like Disney movies is because of their message or moral of the story. This movie talks about friendships, family, and so much more. If I can give you a one liner it would be in Alice's words, "The only way to achieve impossible is to think of the possible". Something like that. I recommend this movie as a family movie. It was really good. I cried. I loved, loved the messages in the movie. This movie plays with time. One more thing, do not let time pass you by. These are the moments and memories we make with our families. Enjoy them while you have them. I suggest you grab the family and take them to the movies this weekend. Then talk with your kids about what they thought the movie was about. What did they learn? Movies are a great way to start conversations. I cannot wait to watch it with my daughter! !